This is an updated and remixed version of the ground-breaking men's book Dead Men Walking. 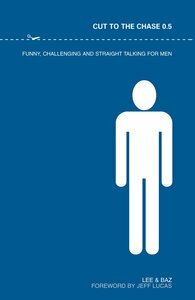 Five years later, the authors are back with a totally rewritten version of the book that pioneered the way for honesty and reality in books for men. With ten new chapters, plus amendments and rewrites of their favorite ones, this is a true remix of an out-of-print men's classic that was written as a brutally honest account of what it is to be a Christian man today. The book is raw, rude, offensive, gripping and occasionally gut-wrenching, with an honesty that will leave readers breathless and a call that could seriously mess up ones life - in the best way possible. About "Cut to the Chase 0.5"
Lee Jackson is probably the UK's most experienced schools / college / education speaker, and for the last 20 years has been working with young people in schools, youth groups and secure units. Baz Gascoyne lives in Sheffield, South Yorkshire, where he co-leads the Eccles church.